Although the insurance industry is less affected than the banking industry, the credit crisis has revealed room for improvement in its risk management and supervision. Based on this observation, we formulate ten consequences for risk management and insurance regulation. Many of these reflect current discussions in academia and practice, but we also add a number of new ideas that have not yet been the focus of discussion. Among these are specific aspects of agency and portfolio theory, a concept for a controlled run-off for insolvent insurers, new principles in stress testing, improved communication aspects, market discipline, and accountability. Another contribution of this paper is to embed the current practitioners’ discussion in the recent academic literature, for example, with regard to the regulation of financial conglomerates. In this paper, we address the credit crisis from the perspective of the insurance industry. Our aim is to highlight the impact the crisis had on insurance companies and to derive consequences for risk management and insurance regulation. The prudent and conservative business policies that most insurers engage in have proven the industry to be quite resistant throughout the crisis. However, not all insurance market participants have followed such a prudent strategy (e.g., American International Group (AIG) or Yamato Life). Hence, the crisis has revealed several deficiencies in the fields of risk management and supervision. Based on these observations, the aim of this paper is to formulate ten consequences for risk management and supervision. Many of these consequences reflect current discussions in academia1 and practice,2 but we also integrate a number of new ideas that have not yet been the focus of discussion regarding the credit crisis. Among these are some basic lessons from agency theory and portfolio theory, the consideration of a controlled run-off for insolvent insurers, new principles in stress testing, and improving communication, as well as aspects of market discipline, and accountability—especially in respect to rating agencies. Another contribution of this paper is to embed practitioners’ discussion in academic literature, for example, with regard to management compensation or the regulation of financial conglomerates. Although it might be too early to draw conclusions about the credit crisis, a discussion of potential consequences can be helpful in the political decision-making process. This process is on the agenda and it might not be there by the time scholars have collected empirical evidence on its different aspects. Beyond this background, however, we should highlight the consequences for which we have sufficient evidence and where we see a need for future research. Most consequences we discuss are applicable not only to insurance, but also to other sectors of the financial services market. We think that one of the most fundamental lessons from the crisis is that financial services should take place in an integrated marketplace that combines integrated risk management and supervision. The separate regulation of banking, insurance, and other financial services can create options for regulatory arbitrage, which was one of the roots of the crisis. The remainder of this paper is structured as follows. In the next section, we present a short overview of the emergence of the crisis and its impact on insurance companies. 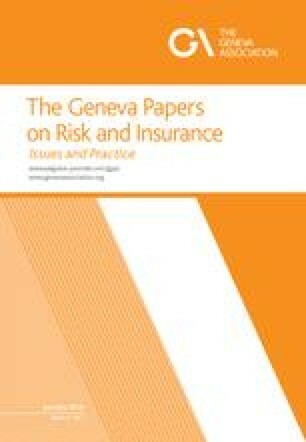 In the subsequent section, consequences for future risk management and supervision of insurance companies are derived. We conclude in the final section with a summary of the policy recommendations. Figure 1 shows the Dow Jones 30 index for the years 2005–2009, along with some of the most frequently mentioned events of the financial crisis. The lower part of the figure emphasizes events affecting the insurance industry. Here we divide the financial crises into four phases. The first phase was a time of low interest rates and increasing U.S. housing prices (reaching its maximum in 2005). Warning signs then appeared in Phase 2 (2006 until August 2007), for example, with a flat and then inverse yield curve. The subprime crisis in U.S. housing then started in the summer of 2007.6 One of the first visible events in respect to the financial crisis was the bank run on Northern Rock in September 2007 and the consequent support from the Bank of England (beginning of Phase 3). At that time, many market participants in the banking and insurance industry reported large write-downs due to mortgage defaults or related problems in credit markets. Among these were Merrill Lynch, Citigroup, and Swiss Re (Swiss Re is only one of many insurers to suffer write-downs, but it was the first large write-down in the insurance sector and is thus mentioned). Then the fourth phase of “big hits” and government bailouts began in September 2008 with the federal takeover of Fannie Mae and Freddie Mac, the bankruptcy of Lehman Brothers, and Federal Reserve support of the AIG. Merrill Lynch was sold to the Bank of America and Morgan Stanley as well as Goldman Sachs changed their status from investment banks to traditional bank holding companies. Among the subsequent events were the Royal Bank of Scotland announcing the biggest corporate losses in U.K. history (January 2009) and AIG reporting the biggest corporate losses in U.S. history (March 2009). 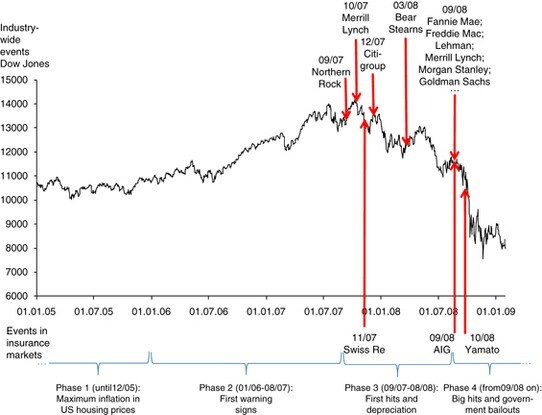 Dow Jones 30 index and main events of the financial crisis. The three most often reported events of the crisis for the insurance industry are the government bailout of the AIG, the write-downs at Swiss Re (due to reinsurance in credit portfolios), and the insolvency of Yamato Life Insurance (due to severe risk management failures in asset management). All three events have different characteristics and illustrate that insurers’ balance sheets were affected by different aspects of the crisis. These cases thus show that an adverse scenario can include a combination of negative developments on both the asset side and the liability side. But the different nature of these three events also reveals that they had only a limited systematic impact at the global industry level. Only some insurers were directly affected from investments in structured credit products, but most felt an indirect impact from the losses in many investments during the recent capital market plunge. That these effects on asset management can produce a threatening economic situation is illustrated by the Japanese life insurer Yamato Life Insurance. This company experienced losses in the subprime area, and losses due to a high investment in stocks. From the underwriting side, however, no specific problems have been reported. While insurance regulation has already been the subject of reform in Europe (Solvency II, Swiss Solvency Test (SST)) the ongoing financial market crisis has focused even more attention on risk management and regulation in financial services, both in academia and practice. Issues related to supervision and corporate governance have often been deemed causes of the crisis. These issues include pro-cyclicality and similar behaviour due to regulatory rules, regulatory arbitrage, inappropriate accounting rules based on historical acquisition costs, lack of transparency, and inadequate management decisions, probably driven by wrong incentives. While we might or might not be out of the crisis, there is a consensus in literature that the interaction of several deficiencies caused the crisis,14 making it impractical to single out individual culprits. We therefore believe that numerous consequences should be drawn from this crisis. In light of the challenging market environment, strong enterprise risk management is a crucial element in maintaining financial strength and ensuring a safe insurance industry. Risk management must be proactive, independent, and have sufficient power and authority. Independence is important because of possible conflicts of interest, including those between the underwriting sector, the sales department, and risk managers. It will also employ agency theory to hold risk managers accountable for the behaviour of insurers on behalf of potential crisis victims. Risk management must play a leading role in each insurance company, which could be accomplished by transferring the concept of “responsible actuary” (“verantwortlicher Aktuar”; implemented in Germany, Austria, and Switzerland) or “appointed actuary” (in the United Kingdom, Belgium, and the Netherlands)18 to that of an “appointed risk manager”. By law, the responsible actuary has a predefined function, responsibility, independence, and reporting requirements with regard to the board. The “appointed risk manager” could also be a contact person for the regulator in order to ensure that regulatory rules are embedded within an integrated risk management scheme. Note that in some countries the function of risk management is one of the duties of the “appointed actuary”. In such a case, we either need to separate the tasks of the “appointed actuary” from those of the “appointed risk manager” or combine both jobs into one position enjoying greater power and authority. We believe that splitting this large and important task into two positions will work best: the “appointed actuary” being responsible for adequate premium and reserves calculation among others, and the “appointed risk manager” being responsible for an integrated risk management process at the company level, and implementing the results in an integrated risk management process.19 Clearly defined responsibilities, along with close collaboration between these two functions, are two important prerequisites. One of the greatest pitfalls of risk models and solvency approaches is model risk. For instance, there is always the possibility that the underlying risk distributions have been wrongly specified. This can occur when there is not a sufficient number of historical observations available (a smaller data set, ceteris paribus, increases the probability of a misspecification). Moreover, the underlying distribution might not be stable over time and, hence, probability distributions observable in the past provide very little information about the future. In addition to misspecifications as to the “true” probability distributions, the chosen stochastic model itself might be inappropriate. To guard against too much faith being placed in a specific risk model/solvency approach and its assumptions, we believe that it is important to vary the implicit model parameters in a specified range, similar to what is done in stress testing. By doing this, risk managers and regulators can obtain a much better understanding of the sensitivity of specific results of the solvency model and provide additional information regarding an insurer's main sources of risk. A first step in this direction—one that has less to do with model risk, and more to do with the economic environment—has been taken in the scenario testing concept given of the SST. Another question in the modelling context is what risks should be considered. The most dangerous risks are the unforeseen risks. Typically, market, credit, and underwriting risk are modelled, but the credit crisis has shown that we do not have sufficiently good models to handle liquidity risk.26 Thus, we need to develop new models for liquidity risk management and we need to take into consideration new risk sources that have not yet been the focus of discussion. In addition, we need to remember that one of the main assumptions of many pricing and risk management models is a liquid market. If a liquid market does not exist (anymore), the use of such models is highly questionable. Another point that should be kept in mind is that mathematical models are typically not constructed to anticipate risk sources that are not, in some manner, foreshadowed in historical data. New risk sources can thus not be easily quantified by mathematical models. Regarding the risk management process, mathematical models can be helpful for analysing a loss exposure, but other techniques from the field of risk identification (such as questionnaires, inspections, check lists, among others27) are needed to identify the loss exposure. In this context, it is important to strengthen the risk perception of all stakeholders and to define a clear and simple process for communication of potential risks within the insurance company. The interaction between risk models, the risk management process, and managerial decisions can be improved. The best risk models are useless if the results are not understood by the people who make decisions. A serious problem in this context is the communication gap between risk managers and decision-makers on the executive board. Stulz describes how communication failures have played a key role in the crisis.28 Union de Banques Suisses (UBS), for example, published a report for its shareholders in which it discusses the causes of its subprime-related write-downs. In that report, they note that “… a number of attempts were made to present subprime or housing related exposures”. The reports did not, however, communicate an effective message for a number of reasons, in particular because the reports were overly complex, presented outdated data or were not made available to the right audience. Risk managers and actuaries develop and implement risk models and it is likely that most of them are aware of the underlying assumptions and limitations of the model when interpreting its results. However, the executive board may not have the same degree of competence in this particular area or the time to develop it. Thus, they require easy to use and understandable statistics. However, due to the inherent problems of models as discussed above, regardless of how well presented, their results should not be the sole basis for management decisions. Model results are best employed as supporting, either for or against, different strategies. How the statistic output of a risk model is communicated to top management is crucial. Here, we believe that the communication skills of risk managers and actuaries can be improved, for example, by using more intuitive forms of communication, such as graphs and diagrams, instead of long lists of numbers and complicated tables and equations. However, management also needs to be a little more flexible in its decision-making process, looking at things more in terms of confidence intervals. Effective communication of results and effective use of results can be hugely important to a firm's success.29 Communication is another area that might benefit from the concept of an “appointed risk manager” with independence, a clear function, and reporting requirements to the executive board (see consequence 2). In this respect, the financial crisis makes a strong argument for improving the education of model users and decision-makers. Considering real-world complexity and communication, we also believe that it is important to keep simple “manual” management rules in mind. Limits on asset allocation are a very simple and intuitive way of ensuring diversification of risk. Another simple instrument that prevents excess risk taking is risk sharing, for example, via retention. A very problematic development during the financial crisis was the excessive securitization and retrocession of risks. Risks were transferred from one party to another without any amount of risk retained, leading to poor underwriting and risk classification. Generally, retention is a very effective way to delimit moral hazard and the adverse selection problems that are inherent to such transactions. In this context, it is important to require a retention scheme for retrocession. Compensation based on options have often been identified as a problem during the crisis; it can create an incentive to raise risk taking to an unacceptable level.34 Agency theory suggests that since the value of option-based compensation is positively connected with the underlying stock variance, granting option-based compensation to CEOs will motivate them to take on higher levels of risk.35 We agree with the CRO Forum that the principle of performance-related compensation is the right one, but it must be correctly applied.36 Performance-related compensation can encourage excessive risk taking. In this context, a consequence is that compensation based on options should not be short term by nature, but instead oriented to the long-term success of the company. Two of the best-known and accepted lessons from portfolio theory are (1) that there is a positive relationship between risk and return and (2) that one should not put all one's eggs in one basket. While most insurance companies follow a prudent business policy, we believe that some market participants have not taken these two lessons to heart in recent years. There is a natural relationship between risk and return in capital markets, and no market participant can expect an unusually high level of return without a corresponding high level of risk. If there arises an opportunity to achieve “higher than usual” gains, all market participants will quickly reallocate their funds in the direction of that investment opportunity. The massive and sudden increase in market price then eliminates the opportunity. In other words, at least in theory, there is no free lunch in capital markets.37 This basic rule should be true for other markets as well, for example securitization. Portfolio theory also illustrates the advantages of investing in different assets, regions, and markets. One problem revealed as the crisis developed was that many instruments considered to be very safe actually were not. Adequate diversification across different instruments, regions, and markets should be a part of every prudent investment strategy. As mentioned, AIG had CDSs insuring US$ 440 billion of MBS—a situation that reflects no sufficient diversification. One problem in the recent crisis was the sensitivity of different asset classes to extreme events in other asset classes. Unexpectedly, high correlations were triggered as disaster in one asset class spilled over into others (see also consequence two on non-linear dependencies). Some small banks largely avoided MBS and other securitizations and many practiced very conservative lending policies, but found themselves in trouble when homeowners (their borrowers) lost income, and economic activity froze up even though these banks had money to lend. It might thus be arguable whether diversification could have provided sufficient protection against the recent crisis. In an extreme scenario, all economic activities may be subject to spillover and hence only global political actions may be successful in such circumstances. However, we see two different points in this discussion: (1) the problem of spillover effects that might limit diversification also if a portfolio is diversified; and (2) the lack of portfolio diversification that might have troubled companies such as AIG in the absence of spillover effects. Solvency II and the SST focus on an enterprise risk management approach in order to obtain equity capital standards.38 In our opinion, the steps toward more principle-based regulation taken here are a move in the right direction for reducing the effects of the financial crises. The idea behind principle-based regulation is that the regulator provides only a set of principles to follow, but does not prescribe exactly how to implement the principles. Table 1 summarises the main pros and cons of principles- and rules-based regulation. A major drawback of standard rules-based models is that they do not have the flexibility to handle individual situations and thus might not be very effective in assessing the wide range of insurance risk profiles. Generally speaking, a principle-based approach is more flexible and better able to capture an individual risk profile, for example, by using insurer-specific model parameters instead of ones predetermined by the regulator. A principle-based approach may also trigger innovation, such as when insurers need to develop their own risk models. Furthermore, the principle-based approach provides the insurer with the opportunity to integrate regulatory requirements into its risk management process. Business and regulatory objectives are then more closely aligned and should lead to more efficient regulation. Another advantage of using principles instead of strict rules is that doing so has the potential to reduce the danger of similar behaviour and, in turn, systemic risk within the market. However, a principles-based approach is not without its downside. Relying on principles could increase the complexity and costs of regulation, both for the insurer and for the regulator, the latter needing sufficient resources to appraise all the individual models instead of one standard model.39 In addition, the degree of freedom inherent in principles-based regulation might be abused by some market participants to lower their capital requirements so that the regulatory requirements are less strict (problem of “loosening up”). Given a choice between internal risk models and a standard model, insurers may use internal risk models only if it results in lower capital requirements. And in case of using internal models, insurers again have incentives to use their freedom to lower the capital requirements since there might be different ways to model the main risk drivers (e.g., regarding distributional assumptions). Principles-based regulation might thus offer opportunities for model arbitrage, while rules might be clearer and enable market participants to compare the results more easily. We believe that allowing insurers to use internal risk models is a move in the right direction, for three reasons. First, as mentioned, the use of different approaches may prevent “systemic risk” within the capital markets. More precisely, the risk of identical reactions given an unusual market event (e.g., stock crash) is reduced.41 Thus, it might make sense to have multiple solvency models, allowing market competition to determine which ones work best. Recently, the CRO Forum analysed the pro-cyclical nature of Solvency II and proposed a solution to address the problem:42 in times of distressed markets for certain assets, the solvency capital requirement (SCR) is temporarily complemented by a reduced capital requirement, documented under Pillar two and subject to disclosure under Pillar three of Solvency II. The lower capital requirement shall only be applied if case management intends to hold these assets over the duration of the liabilities it covers (i.e., typically longer than the one year planning horizon of Solvency II). We believe this to be an appropriate way to counteract market downturns. Second, another problem with standard rules-based models—and one that can be handled much more easily with internal risk models—is up-to-dateness. Daníelsson, for example, claims that Basel II is state-of-the-art for 1998.43 In the insurance industry, this problem is even more severe. The length of the Solvency II process in the European Union (EU) is a good example of how difficult it is to introduce an innovative regulatory system. Political decision-making takes time, and usually needs a triggering event to actually occur. In the EU, this trigger was the formation of the common financial services market in 1994, but even so the new framework is not expected to be introduced until at least 2012. Third, it can be argued that the attempt to avoid rules by creative new products that lie outside rules-based regulation was one of the root causes of the crisis. AIG's CDSs were not adequately recognized in insurance regulation since CDSs were not regulated and were not even categorized as a traditional insurance product, so that AIG did not have to provide risk capital for potential losses from this area.44 It might thus be that a principle-based approach that calls for consideration of all relevant risks makes gaming the system more difficult. In the case of distress of financial institutions, recent defaults have been (partly) covered by the governments. Such action, which basically means that the taxpayers have to pay any discrepancy between liabilities and assets, eliminates an important element of a free market economy. In a competitive market, such action will create wrong incentives for policy-holders, equityholders, and the management of an insurance company. To allow a controlled run-off for insurance companies, an insurance guaranty fund is an option. In contrast to the way it is done in some countries, risk-adequate premiums—for instance, based on the default put option value—are required for the funds in order to avoid cross-subsidization.46 Guaranty funds can create a put-option-like subsidy to equityholders, which also might create incentives for risk taking.47 A risk-adequate pricing of the premium in a competitive market is thus an important prerequisite for a guaranty fund. Calculations based on empirical data are necessary here in order to derive a minimum level of an insurance guaranty fund under different market scenarios and assumptions regarding the interrelations between the insurers in place. Since the creation of such a guaranty fund will, ceteris paribus, lead to an increase in policyholder premiums, it is necessary that all major insurance markets be subject to similar rules, including the banking industry, since insurance companies and the banking industry sell many similar products. However, both the creation of a guaranty fund and advanced solvency rules lead to a high degree of regulation and, consequently, high transaction costs, so the costs and benefits of regulation should be weighed carefully before it is implemented. Given the increasingly frequent consolidation activity in the insurance market, the advantages and risks of corporate diversification have become a focus of regulatory authorities. As stated in the literature, conglomeration leads to a diversification of risks—the so-called diversification benefit—but, at the same time, to a decrease in shareholder value—the conglomerate discount.48 To obtain accurate information about the safety level of a financial conglomerate, analyses must be conducted at both the single legal entity level and the enterprise level. In particular, capital and risk transfer instruments used between different legal entities within the financial conglomerate need to be taken into consideration. Additionally, non-insurance entities (banks or non-supervised companies) that are a part of the conglomerate need to be investigated by regulators in order to judge whether they substantially influence the overall risk situation of the conglomerate. In this respect we support the Pan European Insurance Forum, which argues that—at a global level—group supervision should be achieved through multinational recognition of foreign supervisory activities.49 This will necessitate a set of general standards for the main insurance markets so as to avoid market distortion within different countries. Globalization and deregulation have led to an integrated financial services market, and consumers have generally benefited from the lower prices and higher quality services made possible by increased competition. However, it is hardly possible to distinguish business activities between different financial services providers and across different countries. The credit crisis has illustrated that financial services are one integrated market, one that is in need of integrated risk management and supervision. Separate regulation of banking, insurance, and other financial services providers invariably creates opportunities for regulatory arbitrage, which was one of the roots of the crisis. This holds not only for different parts of the industry (banking, insurance, pension funds, and other financial services providers), but also across countries. There are prominent examples of the importance of regulatory arbitrage in the crisis: With regard to regulatory arbitrage across countries, many banking subsidiaries have been created in Ireland due to lower regulatory requirements and tax advantages, such as the German Hypo Real Estate subsidiary Depfa bank. In recent years, insurance companies also sold many products from the Irish jurisdiction for many of the same reasons. The problem with the cross-country design is that the regulatory authority and competence is limited when multiple countries are involved. The German regulator BaFin, for example, claimed that it was not authorized to assess the risk of the Irish Depfa bank.50 The AIG case is an example for regulatory arbitrage across banking and insurance companies. AIG sold credit-default swaps for MBS to banks, which was an easy way for the banks to lower their capital requirements since AIG had a “triple A” rating.51 The immense credit risk potential with AIG was not assessed, since the risk of CDSs were not adequately recognised in the insurance regulation frameworks. To ensure a safe financial services industry in the future, it is necessary that regulation itself becomes “globalized”. We need international cooperation and an international regulatory institution for coordination. However, due to complexity and cross-country differences, we do not think that a centralized global institution can conduct efficient supervision. Rather a non-centralized structure with single responsibilities for local financial institutions and a close coordination between the different regulatory authorities in respect to global financial institutions can be the most efficient way to create a sound future financial architecture. When multiple countries and industries are involved, one lead regulator should be clearly denoted. Transparency is crucial for complex financial products. Particularly in the case of retrocession, it is essential that the underlying risk and all involved intermediaries be known. The buyer of a product should be aware of the sensitivity of the product price with regard to changes in financial markets, such as changes in interest rates or volatility.56 Also, interdependencies with other types of risk in the investment portfolio should be unambiguous. Rating agencies are accused of bearing a strong responsibility for the subprime crisis57 and also are in need of much greater transparency. The crisis has shown the flaws of the business model in the rating industry, with conflict of interest in generating revenues from the insurers being rated. The problem is thus not inherently with ratings, but with the rating industry, so that a reform of the business model of the rating industry should be added to the agenda.58 The existing self-regulatory framework for rating agencies based on the 2004 International Organization of Securities Commissions (IOSCO) Code of Conduct is thus not enough and further international level regulatory measures are needed. Moreover, the insurance industry itself will benefit from more transparency since reputation in general, and customer and shareholder trust specifically are key assets.59 Enhancing market discipline should thus be encouraged and will be rewarded with increased consumer trust. Toward this end, we suggest more disclosure with regard to the valuation of assets and liabilities. In this context, a unified framework for a market-consistent valuation of assets and liabilities, and a transparent disclosure of all underlying assumptions would be beneficial.60 More transparency is also needed in the area of off-balance-sheet obligations, as these are crucial in determining the insurer's risk situation. Additional disclosure requirements will enable market participants to better understand the risk situation of an insurance company. As a consequence, effective risk management will be appreciated by the market and risky behaviour sanctioned. More information also reduces agency conflicts, that is, information asymmetries between insiders (management) and outsiders (analysts, stockholders, policy-holders) and thus uncertainty. Accountability is another important aspect not very much discussed so far. One idea, for example, is to introduce accountability for rating agencies. Rating agencies might take more care with their ratings if they faced liability for the consequences incurred by making inaccurate ratings—for instance, if available and relevant information is not taken into account. It might be that the potential liabilities arising from a wrong rating decision are higher than the capital that rating agencies have. However, one solution for such a “low frequency, high severity” situation could be the purchase of insurance coverage. Insurance premiums might have to be quite costly, but the price could be lowered, for example, by retention and other safety measures such as internal risk control. We believe that all these measures that would accompany accountability would create the right incentives and improve the safety of the financial services industry. The same mechanisms might also be considered for D&O insurance or for regulators. A substantially high retention to be paid by the managers themselves might have helped avoid the excess risk-taking observed with some market participants in recent years. One of the most important aspects is that there should be a direct connection between those who make decisions (e.g., managers) and those who have to bear the (negative) financial consequences. It was lack of this connection that is responsible for at least part of the current financial crisis.62 Thus, we believe that more consideration of accountability—of regulators, rating agencies, and managers—is an important step that can be taken, even more important than imposing another set of regulations. The point can be made that we might not be out of the crisis yet and that we do not yet understand the details of the crisis well enough to derive precise consequences from it. Some lack of understanding, however, will not prevent policy-makers from proposing new legislations. Therefore, we think that it is important to outline potential consequences that we see from the crisis—even though we have to admit that we have, in some cases, no empirical evidence that clearly supports our line of reasoning. In this context it is important to highlight for which of the consequences derived we believe to have sufficient evidence and where we see need for future research. As a summary of the discussions presented in this paper, Table 2 provides an overview of our policy recommendations, how these recommendations are related to the crisis, whether there is sufficient evidence, and what concrete measures for implementation of our recommendations might be. Fields where we see need for future research are displayed in the last section of Table 2. • A number of articles show how bad incentives can be created by wrong compensation programmes (Coles et al., 2006; and Low, 2009). Considering Table 2, many of the problems and solutions are not unknown, but acquire special relevance in the light of the crisis. Significant need for future research can be identified, however, considering modelling of liquidity risk in the insurance industry. Another important aspect is to evaluate the impact of transparency and market discipline in insurance markets, especially outside the United States. In general, there is need for empirical work on the effects of the crisis in risk management and regulation whenever data become available. Furthermore, careful monitoring of the policy measures that are undertaken right now must be carried out in order to learn for a future crisis. Among these problems is also a critical review of principles-based regulation that is now implemented in some countries, since it might lead to problems such as abuse of freedom by some market participants. In addition, concepts are needed for a controlled run-off of insurance companies whenever a default occurs. See, for example, Felton and Reinhardt (2008); Schanz, (2009). See, for example, CEA (2008); CRO Forum (2009). See, for example, CEA (2008). See Pan European Insurance Forum (2009). See, for example, Grace and Hotchkiss (1995). See Reinhart and Rogoff (2008). See Fromme and Krüger (2009). See Mai and Bayer (2009). See Baranoff and Sager (2009); Harrington and Moses (2009). For more details on AIG, see Sjostrom (2009). See AM Best (2009). We are grateful to an anonymous referee for highlighting similarities and differences between Europe and the U.S. insurers and between different lines of business. Many U.S. life insurers hold a significant amount of their assets in MBS (see Baranoff and Sager, 2009), which is not the case in many continental European countries due to restrictions in asset allocation. Like their counterparts in Europe, most U.S. life insurers do not own much stock so that they are not too threatened by the equity market meltdown. More worrisome to them are the guarantees that they have made to variable life annuity holders, by which the insurer participates in the market risk of annuitant portfolios. In Europe this problem has already led to a substantial redesign of insurance products in that certain variable annuity contracts with guarantees are no more sold. For other lines of business, the situations in Europe and the U.S. are comparable. Health and property/casualty insurers have done better than life insurers, because their need for cash to pay claims curbs their inclination to invest in long-term securities. Reinsurers are less restricted in their business model and also have exposure to MBS. See, for example, Diamond and Rajan (2009); Mishkin (2009); Crotty (2009). See Pottier and Sommer (2002). See, for example, Eling et al. (2008). The appointed risk manager shall thus be responsible for loss identification, measurement, and proposing adequate techniques for treating the loss exposure. The risk manager shall also establish a comprehensive risk report to be discussed both with the board and the regulator, and be responsible for implementing the results of this discussion in the integrated risk management process. To contribute to this, the manager should hold a high rank in the hierarchy (at senior management level with direct access to the board). Note that the new position of appointed risk manager reflects the recommendations of the De Larosière (2009) report for future risk management. See Eling and Toplek (2009). See, for example, Embrechts et al. (2002). See, for example, Achleitner et al. (2002) and Ashby et al. (2003). See, for example, Yamai and Yoshiba (2005). See Dowd and Blake (2006) for further discussions of risk measures. See, for example, Rudolph (2008). See Eling et al. (2008). See, for example, Fama and Jensen (1983). See Saunders et al. (1990); Doherty and Garven (1986). See Crotty (2009) for illustrative examples. See, for example, Coles et al. (2006) and Low (2009) for empirical evidence. See, for example, Bodie et al. (2008). For an overview of the Solvency II process, see, for example, Eling et al. (2007). See, for example, Eling et al. (2007). See Cummins and Doherty (2002). See, for example, Doherty and Garven (1986). See Cummins (1988); Lee et al. (1997). See Gatzert and Schmeiser (2008). Pan European Insurance Forum (2009). See Brost et al. (2009). See Flamée and Windels (2009). See Stulz (2008) for examples. See Lee et al. (1997); Downs and Sommer (1999) for empirical analyses. Holmström (1979) shows that in moral hazard problems more information about the agent is never detrimental to the principal and, under mild assumptions, it is strictly beneficial. Epermanis and Harrington (2006) provide an empirical analysis of the U.S. insurance market and show that market discipline exists at least to a certain extent. An important aspect in this discussion is guarantee funds. If government guarantees all insurance contracts, there is no reason to believe that there is market discipline (see Downs and Sommer, 1999). In technical terms, this would mean that the buyer should be aware of all “Greeks” from option pricing theory, that is, how does the product price react to a sudden change in interest rates (rho) or volatility (vega). See Duff and Einig (2009); Stolper (2009); Mathis et al. (2009). Representatives from the rating industries would claim that reputational concerns limit the conflicts of interests. However, Mathis et al. (2009) illustrate both in a theoretical model and using empirical data that reputational concerns might not be sufficient to discipline rating agencies. Thus, they propose a new business model (the platform-pays model) with an intermediary that aggregates the interests of the two sides of the market, for example, by collecting fees and controlling the ratings process. Several other policy responses have been discussed in literature such as Goodhart (2008), Portes (2008), and Stolper (2009). The request for standardized information is not hampered by the use of internal risk models. We believe that the internal models are more accurate in providing such information than standard rules-based models. Internal models should be fitted to the individual situation of insurance companies in order to reflect the true risk profile more accurately. Different internal models are thus not directly comparable, but given that they are built on the same principles, the resulting information could at least be supplied in some standardized way (e.g., using the same risk measures). Brost, M., Schieritz, M. and Storn, A. (2009) ‘Die Mutter Aller Pleiten’, Die Zeit, Nr. 26, 18 June 2009, www.zeit.de/2009/26/HRE. Fromme, H. (2008) ‘U.S.-Versicherer spüren Kreditkrise’, from www.ftd.de/unternehmen/versicherungen/:Managerhaftung%20US%20Versicherer%20Kreditkrise/372071.html, accessed 20 June 2009. Fromme, H. and Krüger, A. (2009) ‘Versicherer uneins über Weg aus der Krise’, from www.ftd.de/unternehmen/versicherungen/:Finanzplatz-Deutschland-Versicherer-uneins-%FCber-Weg-aus-der-Krise/491587.html, accessed 20 June 2009. Harrington, S. and Moses, A. (2009) ‘Credit Swap Disclosure Obscures True Financial Risk’, from www.bloomberg.com/apps/news?sid=aJzpw_m1iC4M&pid=20601109, accessed 20 June 2009. Mai, C. and Bayer, T. (2009) ‘Gläubiger zittern vor Verstaatlichungen’, from www.ftd.de/unternehmen/finanzdienstleister/:Preisverfall-bei-Bankanleihen-Gl%E4ubiger-zittern-vor-Verstaatlichungen/469565.html, accessed 3 February 2009. Nocera, J. (2009) ‘Propping Up a House of Cards’, New York Times, from www.nytimes.com/2009/02/28/business/28nocera.html?_r=1, accessed 27 February 2009. Swiss Re (2007) ‘Swiss Re Expects CHF 1.2 Billion Mark-to-Market Loss’, press release, from www.swissre.com/pws/media%20centre/news/news%20releases%202007/19%20november%202007%20cds.html, accessed 19 November 2007.